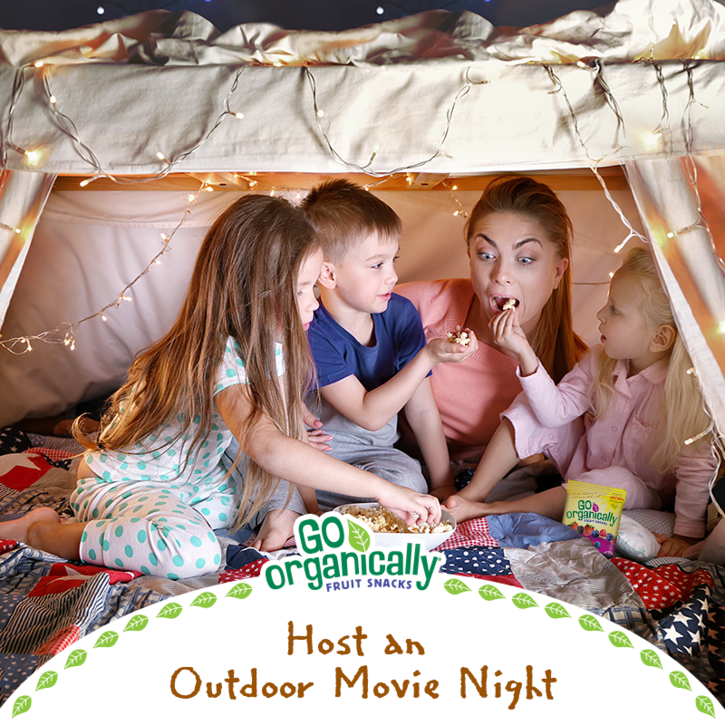 Top Tips to Host an Outdoor Movie Night - Tonight! Lights! Camera! Action! The thrill and excitement of a fantastic movie will always mesmerize moviegoers. Realistically, the expense of entertaining the family for a day or night at the movies can stretch our budget a little thin. Taking advantage of balmy summer nights serves as prime time for family and friends to gather round outdoors for the best movies and even better memories. We have partnered with Go Organically® for a featured guest post contribution sharing top tips to host an outdoor movie night- tonight! First, the logistics. Scout the perfect spot to show your movie and gather up the proper equipment. You'll need three basic things- a projector, a screen, and a laptop with speakers. *Projector - Buy, rent or borrow a movie projector with HDMI connectivity. Ideally, you'll want one that is rated 2,000+ lumens for proper brightness. Prices range widely for projectors, but you can snag one online for as little as $100. *Screen - You'll need a smooth, flat surface on which to project your movie. You can go simple (the side of your house or a doubled up white sheet hung from a clothesline) to more deluxe (a souped-up DIY screen that you build yourself, or an inflatable or foldable screen that you buy or rent). The choice is yours! *Laptop with speakers - You'll need a laptop that plays DVDs (preferably Blu-ray) along with plug-in, portable speakers. Add some drama with details and décor to fit the theme. Remember- you can go as simple or as elaborate as you'd like depending on your schedule, budget or level of craftiness. Either way, your event will be a smash hit! *Invitations - Send invitations that double as "tickets" that can be collected as guests arrive. *Seating - Pepper your lawn with blankets, pillows, and a few low-back beach chairs for comfy seating options. If you're feeling especially creative, build "cars" out of cardboard boxes so that the littlest movie-goers can have a drive-in experience. *Decorations - Hang paper lanterns from the trees or string up twinkly lights to illuminate walkways. Have the kids make a giant poster board sign welcoming everybody to your family "theater." *Accessories - Hand out festive glow necklaces and bracelets to the kiddos to help them navigate in the dark. Put out some potted citronella plants and have natural bug repellent on hand in case mosquitoes try to crash your party. *Popcorn - We love the look of an old-fashioned popcorn machine. You can buy one quite reasonably nowadays, or even rent one from a local vendor. Alternatively, simply make some microwave popcorn and serve it in individual red-and-white striped popcorn boxes or bags. Try a sweet-meets-salty flavor combination by mixing popcorn with Go Organically Organic Fruit Snacks. *Concession Stand - Set up a table off to the side to serve as a concession stand for drinks, candy and other snacks. Serve organic juice boxes and water for the kids and a variety of beverages for grownups. *Snack Trays - In lieu of a concession stand, make individual snack trays for each moviegoer using plastic bento boxes or dollar store shower caddies. Fill the largest compartment with popcorn and the small compartments with convenient single-serve snacks, such as gluten free fruit snacks from Go Organically.